Legal fees related to the Bank Guarantee account for much of the expenditure, but other consultancies cost the State around half a million euro. 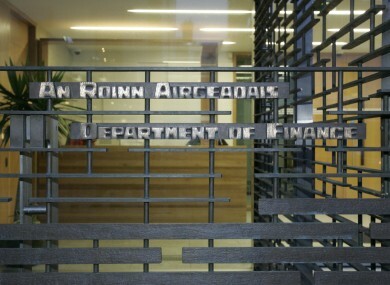 CONSULTATIONS ON THE demand for credit by small and medium enterprises, tax credits for films and an assessment of the Credit Review Office were part of an overall expenditure of €3.67 million at the Department of Finance in the 12 months up to 31 May this year. The Minister for Finance revealed the figures in a recent parliamentary answer. Michael Noonan was responding to Sinn Féin’s Mary Lou McDonald who asked for a breakdown of consultancy fees paid out by the department. The figures reveal that legal firm Arthur Cox, who have been paid a total of €5 million by the department since 2011, received €2.5 million of that figure in the 12 months. Just over €981,012 has been paid this year. In the answer, they are labelled as “legal services”, but an earlier parliamentary question shows that the money was paid for advice related to the Bank Guarantee Scheme. Matheson, another legal firm, were paid €670,790.68 for work carried out in relation to Irish Life. The financial services company was recently sold for €1.3 billion. Mercer financial services were paid €140,000 for their input into the reductions in pay for executives at bailed-out financial institutions, while BDO and Amarach were paid a total of €64,575 for consulting on the Film Credit tax scheme, which was extended to 2020 in the 2013 Budget. Deloitte and Touche were paid over €60,000 for compilation of Government debt statistics. Mazars and RedC were each paid just over €60,000 for two separate studies into the demand for lending to the SME sector. AIB and Bank of Ireland reimbursed the department for these fees. Grant Thornton were paid €31,000 for an assessment of the Credit Review Office and A&L Goodbody were paid €1,414.50 for secretarial fees. A department spokesperson told TheJournal.ie that all contracts are awarded based on getting the utmost in value for money for the taxpayer. Email “The Department of Finance spent €3.6 million on consultancy fees in the last year ”. Feedback on “The Department of Finance spent €3.6 million on consultancy fees in the last year ”.